Disney Channel has ordered a third season of Girl Meets World, their follow up to the Boy Meets World sitcom of the 1990s. Production on the new episodes is scheduled to begin in January with the third season expected to start airing in Spring 2016. Disney Channel has ordered a third season of the comedy series “Girl Meets World.” It was announced today by Adam Bonnett, Executive Vice President, Original Programming, Disney Channels Worldwide. In Total Viewers, “Girl Meets World” is the number one rated series across all kid-targeted, cable-television networks and ranks among the top five cable television series of the year among Kids 2-11 and Tweens 9-14. The series was created by Michael Jacobs and April Kelly and is executive-produced by Jacobs. It stars Rowan Blanchard, Sabrina Carpenter, Ben Savage, Danielle Fishel, August Maturo, Peyton Meyer and Corey Fogelmanis. Production resumes in Los Angeles in January. Season Three is scheduled to premiere in spring 2016. “Girl Meets World” follows the everyday adventures of an unlikely duo, Riley and Maya – a curious and bright-eyed teenager and her bold best friend – who along with Farkle and Lucas, are navigating the ups and downs of life, all while trying to find their unique place in the world. Season Two tackled a variety of storylines that included autism, cyber-bullying and forgiveness. In Season Three, Riley and her best friends will begin a brand-new chapter as they enter high school. 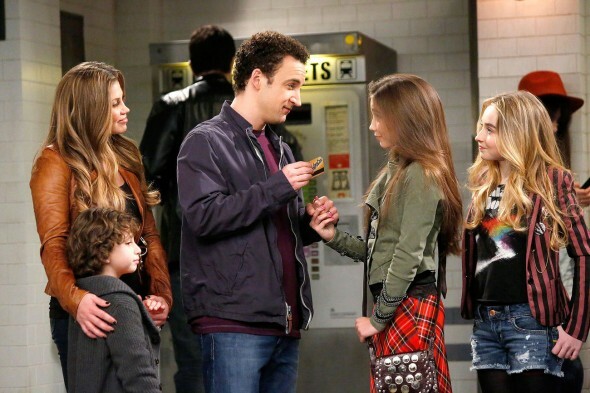 New episodes of “Girl Meets World” air FRIDAYS on Disney Channel. The series is a production of It’s A Laugh Productions, Inc. and Michael Jacobs Productions and carries a TV-G parental guideline. Disney Channel is a 24-hour, kid-driven, family-inclusive television network that taps into the world of kids and families through original series and movies. Currently available on basic cable and satellite in nearly 97 million U.S. homes and to millions of other viewers on Disney Channels around the world, Disney Channel is part of the Disney/ABC Television Group. What do you think? Do you like this Disney Channel series? Should it run as long as Boy Meets World did? More about: Boy Meets World, Disney Channel TV shows: canceled or renewed?, Girl Meets World, Girl Meets World: canceled or renewed? My daughter, who is forty-two, watched Boy Meets World. And I decided to check out Girl Meets World and I loved it. A good clean cut show for children. I really like it. Based on season 1, I’d have agreed with you. I was amazed how the creators managed to recapture most of the charm of the original. Alas, season 2 then occurred and story and character were tossed out the window to make way for political proselytizing. Goes to show one should NEVER watch remakes, reboots or continuations. i always enjoy watching this show. interesting story lines and well acted. not quite sure what “political agenda” previous message referred to…all I know is that I laugh, I cry and I enjoy! Very undeserved as Jacobs and Disney Channel turned what was a fun continuation of his now-classic show into a politically-charged indoctrination program where stories stopped making sense in order to push forward a political agenda on kids and their parents. Truly awful in that it now stains Boy Meets world which was a great kids show.